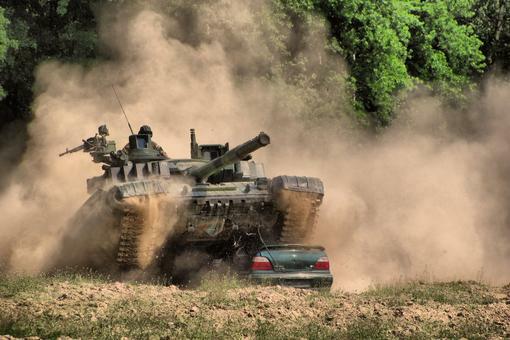 Tank vs Car: Certainly not a Fair Battle! The thing with watches is it is a product that is stuck between the gadget and fashion categories. Some watches are designed to be inclined to being a gadget (think Samsung Galaxy Gear). Some watches are designed to be inclined to being a fashion accessories (think Michael Kors watches). Some watches are designed to be in equillibrium. For this reason, ask anyone to pick the best tough watches and I can guarantee that you’ll never get the same answer every time. Our brains are wired differently and diversity makes the world beautiful. In this battle edition of the toughest, I limit the price range to around $500. I know this is not the best and certainly not the only way to limit the battle participants. But I have one good reason for that. In the past, when I was a newbie, I blindly hunt for the ultimate tough watch. It is not that I didn’t find what I was searching for. However, I was badly disappointed when I found out that even with my lifelong savings, I would never be able to afford the watch. Or maybe for sanity sake, I don’t think I would ever let myself part with my money just for the ultimate watch babe. Since then, I’ve learnt to be more realistic. Later on, I found out that I’m not the only one who had gone through such experience. Many others had the same experience and as in my case, spelling out the budget is the first thing we do when we hunt for a new watch. Ok! I’m sorry for torturing you with the long explanation. Let’s get down straight to business! If you have $500 budget and have little time to dig through the piles of reviews and discussions, which 3 toughest watches should you consider? Here is my pick. 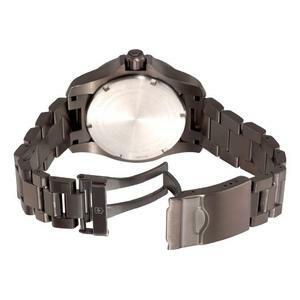 There are several things that you’d have to be looking for to have a sense of how rugged the watch can be. The first thing is the watch movement. Not all watchmakers specify the movement that goes into their watch. Why? 2 simple reasons. It could be the sub-standard quality of the movement or it could be fear of competition. I’ve seen lots of them. More often than not, it is the first reason. 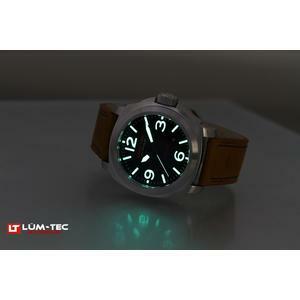 The Lum-Tec M55 is powered by Ronda 515 powertech series and considered as one of the better quality Swiss movement. It is not the top-range movement but do you expect the best movement with $500? If only that is true, I wonder what else could be there to separates a $500 from $1,000 watch. Anyway, you can see from the technical spec that 515 is an analog quartz movement with no chronograph feature. Also, expect battery life to be around 45 months or 4 years. The second thing is watch dial size. The best dial size depends on the size of your wrist. I know you may have a different wrist size than mine. But let’s take the wrist size of an average person. 7″ is the average size. With 44mm dial size (excluding crown), Lum-Tec M55 fits in nicely to the average 7-inch wrist size. Neither it is overly bulky nor it is overly feminine (read small). It is built with sapphire crystal, one of the toughest material to be used in a watch. I’ve not tried but according to the spec, you can bring it down 300 meters below the sea and you can expect the Lum-Tec M55 to survive the ordeal. What you get with the M55 is also Lum-Tec’s highly acclaimed Maximum Darkness Visibility (MDV) technology. If you wonder what this technology offers, it is invented to offer ‘the longest and brightest’ illumination on your watch. Expect markers to glow for more than 24 hours. What do you say? When it comes to finding the best watches under $500, I certainly don’t take it lightly. $500 is a lot of money for ordinary folks like you and me. I know lots of folks have multiple watches lining up in their wardrobe but how often do we splurge for a $500 watch? Once a year, maybe? At least that’s for my case. One thing about the M55 that’s been highly praised is the 3 watch straps that you’re going to get when you buy it. 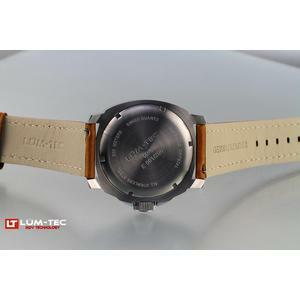 It comes with brown leather strap, anti-static rubber strap and 316L stainless steel strap. I need different straps for different purposes. I’d obviously want a leather strap when I’m going out for casual occasions but not when I’m off to work. When I’m off for a jog or a little adventure trip, rubber and not leather would be the obvious choice. 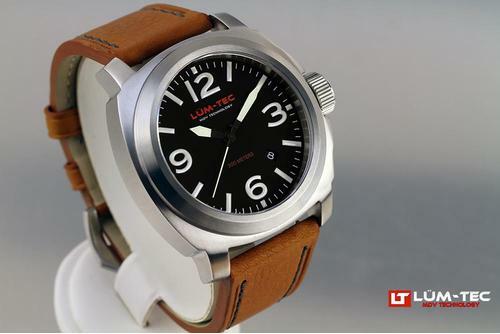 With the 3 straps that come with it, it makes Lum-Tec M55 a highly versatile tough watch. The mention of Swiss Army definitely brings in the image of the rugged multi-purpose knife. There may be many knife makers, but none comes close to match the reputation of the Swiss Army. What has Swiss Army to do with versatile and rugged watches? They may not have the cult of G-Shock when it comes to tough watches, but that doesn’t mean they don’t make great watches. 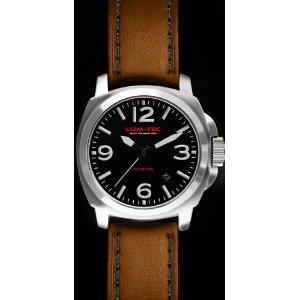 Victorinox 241429 is one such watch. 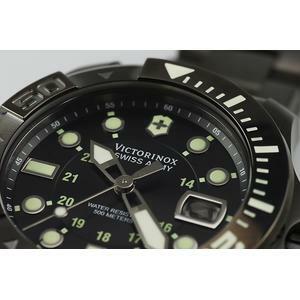 As part of Victorinox’s Dive Master 500 series, this watch clocks an impressive 500 meters water-resistance. If this is the most crucial parameter and you need something that survives more than 300 meters down, this would be the better choice compared to the Lum-Tec M55. 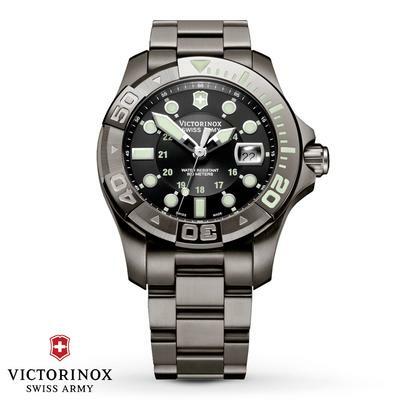 The best part about Victorinox 241429 is its gunmetal finish. So if you love wearing something that looks like a stealth military weapon on your wrist, there are not many alternatives you can find at this price range. If you’re specifically looking for nothing but military watches, you may want to check out our pick for the best military watches. Do keep in mind not to confuse the gunmetal finish with black. It is NOT! If you are looking for a black watch, this is not for you. With a dial size measuring 43mm, it is close to the M55 and good enough for the average-sized wrist. However, I’ve not managed to nail down the movement inside the Victorinox 241429. If you have, please let me know. 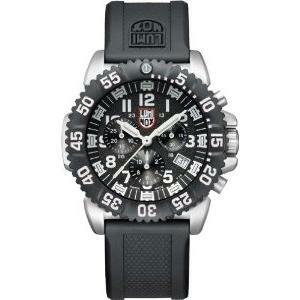 First off, let me begin by highlighting that Luminox watches are Swiss-made and so does the Luminox 3181. The quartz movement used to power this rugged-looking watch is the Ronda 5030.D, which belongs to the Ronda’s special catalogue. I’m not sure how the special series compares to the powertech series, but I have the impression that the powertech series (used in Lum-Tec M55) is superior to the one used for this 3181 piece from Luminox. One area where Luminox watches (including this 3181 Navy SEAL Colormark Chronograph) fare worse than others is the water-resistance performance. Though it is used by the US Navy SEAL, it doesn’t mean they are able to survive the deepest ocean depth. Bring it down further than 200 meters and you may have to say farewell to your Luminox 3181. With the 3181 Colormark Chronograph series, you will find Luminox’s proprietary Night Vision Tubes, similar to Lum-Tec’s MDV. While Lum-Tec’s MDV is great, it doesn’t explicitly mention how long we can expect the lume to last. In the case of Luminox, expect it to last for about 25 years. Impressive! Do you have any watch that is more than twenty years old? With a dial size of 44mm, it is close to the two earlier models we’ve discussed. Coming in at 130g, Luminox 3181 is also close to what you get with the champion, M55. Not too heavy, not too light. I’ve picked my winner for the best tough watch if given a $500 budget. You may agree but you may also disagree. I don’t expect everyone with my choice either. As I mentioned from the beginning, watch selection is one that marries technology with aesthetics. So which of the three is your winner? Looking for options with lower budget? Be sure to check out how the candidates battle it out in the $200 price segment. I think when it comes to watches that are meant to be actually used in tough conditions (subject to water, mechanical shock, vibration), nothing beats a solid-state digital quartz. It’s lightweight and there are no delicate moving parts. Body warmth is enough to keep the batteries going even in Arctic temperatures. I see these “tough” automatic watches as a marketing gimmick or (in better case) as a homage to old classic days. One could abuse 10 cheap digital watches for the price of one mechanical. Sad but true.